With summer almost here it's time to take a look at the new sets and analyze their investment potential. 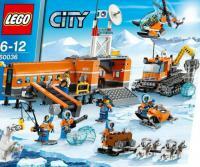 One of the most intriguing sub-themes out there this season is the Arctic themed line of sets from the City theme. Unlike most other city sub-themes that are available this wave and have new sets released regularly or every other year (such as Police, Traffic or Trains) the Arctic line hasn't been seen since 2000 (under the Town theme) and in those fourteen years of growth the standards for minifigures, sets and pieces themselves have been raised. So now the question is how can we find out if the 2014 Arctic sets will perform well? Now unfortunately due to incomplete data and the age of the latter it's difficult to accurately compare the 2014 Arctic sets to their 2000 counterparts, but even though Arctic is the odd one out when compared to the other City sub-themes of this wave we can take a look at some of the other irregular sub-themes released in the past few years which in this case will consist of the Farm (2009-2010), Space (2011) and Mining (2012) sub-themes. By using Brickpicker's lot calculator we can find the current total cost of each sub-theme. So far the Farm sets (7684 7634 7635 7636 7637 7566) have done much better than the other examples, even when taking into consideration the fact that it's had more appreciation time than the other two, with a retail total of approximately $205, a current sale total of $502.12 (almost two and a half times retail) and a return of $297.12 U.S. The 2011 Space sets (3365 3366 3367 3368) have done ok (though again not nearly as well as Farm) with retail total approximately $125, a current sale total of $157.19 and a return of $32.19 U.S. The 2012 Mining sets (4200 4201 4202 4203 4204) have seen the least return, but have also had the least amount of time to appreciate, with a retail total approximately $205, a current sale total of $221.77 and a return of only $16.77 U.S.
Now the following is going to be mostly speculation but it's still backed by some facts. The 2014 Arctic sets will almost certainly do better than the Mining sub-theme and will probably perform a better than the 2011 Space sets but not as good as the Farm sub-theme. Why draw this conclusion? The Arctic sets seem pretty neat with lots of cool pieces, unlike the mostly dull Mining sub-theme which were also designed, for the most part, very similarly to the construction sub-theme. The Space sub-theme sets were well made and interesting enough but they were unfortunately in an over-saturated market for that genre of sets. The Arctic sets, like the Farm ones, are interesting (of particular note are the huskies and polar bears) with most of the sets having a unique design and reside in a market segment with no genre competition, however the latter line of sets are more suitable to the other City sets than the former. So based on the recent performance and comparing the interestingness of other recent City sub-themes I predict that in five years the 2014 Arctic sets will have at least reached an average price of 75% over retail. Nice title, it's great to see someone diverge from the "Good OR Bad" theme which I find is getting a bit old. Nice to see something that isn't the emergency services for a change. I may pick up some Arctic sets once they've been out a while and become heavily discounted, not before. I have been looking forward to the huskies and the snow cat. would love to find 2 of the technic snow cats , one to hord and one to build. only becuse i use to drive them in a past life. I have a sneaky suspicion this sub-theme might not do too well. I grew up in a house with 6 other brothers, and every Christmas, our parents would buy us Lego sets. They started out getting us all sets from the same theme, the idea behind this was that we could all play together and have adventures in the same world. That we did, but this presented a new problem, when you play together with all sets from the same theme the pieces tend to get mixed up, and then the arguments break out over who's piece is who's, we called this the Pieces War, and they were not good days. So are parents had another clever idea, they bought us each a few sets from a specific theme; I would get Castle, another got Space, and so on. Well, surprisingly, this started the War of the Themes, Since each of us could only have one theme, it was a fight to get the best themes. Castle and Space were the most popular picks, and sometimes you could have more than one person pick different sub-themes within a main theme. Well Christmas of 2000, when everyone opened their presents, my brother got stuck with Lego Arctic, and he was furious. Not only could he not have space battles, or wage castle wars, he was stuck outside our small city, because he was in the Arctic! Point being, Lego Arctic definitely wasn't at the top of any of our list, it just wasn't a desirable theme because it did not play well with others. His Lego Arctic sets eventually ended up in our community Lego Bin; a large plastic container filled with sets that no one cared to keep separate anymore (We each had our own personal containers.). I believe the sheer selection of more popular themes will overshadow this release. Just can't imagine too many kids wanting to play with this. On another note, I think it may be popular with collectors who are building diverse city dioramas, or maybe kids who live in the Arctic or cold countries. Just my 2 cents.